I am a dip fanatic. There is just something about dipping that makes food a little more fun. 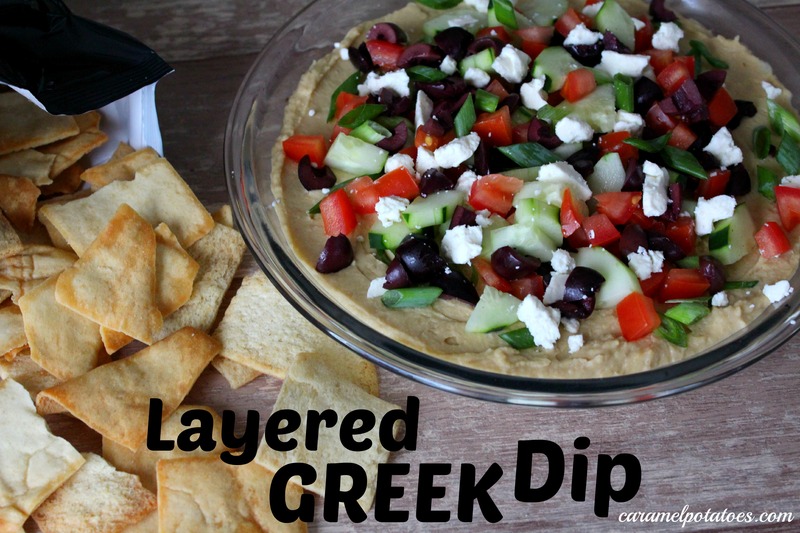 If you are a fan of humus and anything greek flavored you are going to love this Layered Greek Dip. All those salty delicious mediterranean flavors are there. We have it all in a simple dish that is easy to make and easy to eat. In medium mixing bowl beat cream cheese, lemon juice, Italian seasoning, and garlic with electric mixer on medium speed until smooth and combined. Spread cream cheese mixture into a deep 9-inch pie plate, or shallow serving dish. Evenly spread hummus on cream cheese layer. Top with cucumber, tomato, olives, feta cheese, and green onions. Cover and refrigerate 2 to 24 hours. Serve with pita chips and/or multigrain tortilla chips.